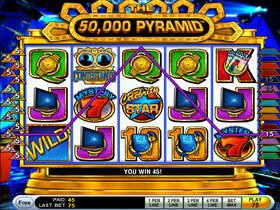 5 Reel, 15 Payline non-progressive video slot featuring Wild and Scatter symbols, Bonus Game, and Free Spins. The Wild substitutes for all other symbols but not the Winner's Circle scatter symbol. 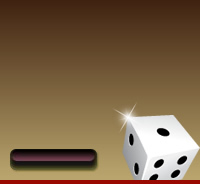 5 Wilds landing on any active payline pay the top Jackpot of 10 000 coins multiplied by the line bet. 3 or more Winner's Circle scatters appearing anywhere on the reels will trigger the Winner's Circle Bonus. 3 or more Scatters trigger the bonus game. A new screen opens with a Pyramid and 15 boxes on 5 levels. Choose boxes on each lit row revealing extra Free Spins and/or Multipliers. Select a box with a ‘Bonus Pick’ to receive extra box selections. Select a box showing ‘Advance’ to climb up to the next upper row. Once the full pyramid is revealed, the bonus round will end and the Free Spins feature starts. Free Spins will start after the Bonus round ends, and they cannot be re-triggered. When 3 or more Winner’s Circle symbols appear during the Free Spins scatter pays will be awarded. The paytable for Free Spins is the same as for the regular game except when 3 or more scatters on the reels award a scatter pay instead of triggering another bonus. The more Winner's Circle scatter symbols, the higher the award multiplier. The actual scatter award is the award multiplier times the bet during the Free Spin Bonus.